For many, Global Dialogue 2013 is more concerned about the formation of a Ministry of Global Peace in the government of each nation of the world. There are several reasons why this is an important step in the history of humanity, and we will make that aspect of our Dialogue an extensive research and development. We ask everyone to participate because this is for all of us on planet Earth. Global Peace Village , a long time project of the Global Community, has always been about the teaching of Peace in the world. This goal may change over time but for now that is what we are doing. Global Peace Village is somewhat different than our Global Peace Earth project in its method of teaching and audiences to reach. 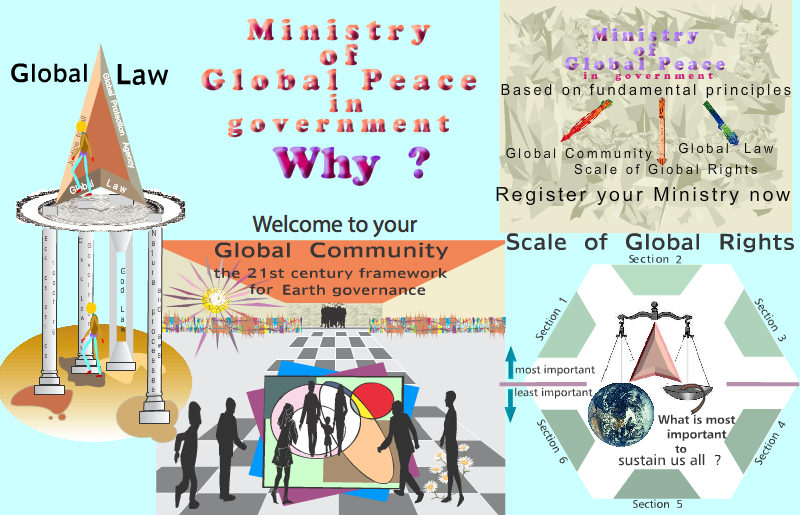 Global Peace Earth reaches all of humanity, collects data from all aspects of life, makes assessment concerning what is the best way forward for all life on the planet, and actually shows the best way forward globally. On the hand, Global Peace Village has a history of dealing with individual communities, knowing their problems and concerns, and making a difference for the better. Of course, both projects work hand in hand for Peace in the world. Our goal for peace in the world can only be reached by resolving those global problems. Those problems have brought up a planetary state of emergency . In view of the planetary state of emergency, shown and declared by the Global Community, we all must change, we must do things differently to give life on Earth a better survival chance and bring about the event of peace amongst us all. There are also long term solutions. The Scale of Global Rights is the fundamental guide to Global Law. Global Law includes legislation covering all essential aspects of human activities. Our first objective was to find statements from all religions, all faiths, that promote ethical and moral responsibility to life and a responsible Earth management. This was assumed to work well within the context of the global civilization of the 3rd Millennium and after defining the Global Community criteria of symbiotical relationships . In this context, we have defined that any symbiotical relationship is for the good of all. It is based on a genuine group concern and unconditional support for the individual's well-being ~ a giant leap in human behaviour. Symbiotical relationships are needed today for the long term future of humanity, for the protection of life on our planet, and to bring about the event of peace amongst us all. Religious rituals now support the conservation efforts and play a central role in governing the sustainable use of the natural environment. The Global Movement to Help , an initiative of the Global Community and of the Federation of Global Governments , is now applying more emphasis on the urgent need from the people of all nations to give everyone essential services. The urgent need to give all Global Citizens essential services was made obvious in the past few years after the occurrence of natural disasters, and the global destruction created by the military. Our Global Peace Movement is about the courage to live a life in a harmonious peace order and showing by example, thus preventing poverty, wars, terror and violence. We need to educate the coming generations with good principles, being compassionate, social harmony and global sustainability being some of them. Throughout Global Dialogue 2013, i.e. from September 1st, 2013, to August 31st, 2013, Global Community will present several methods of teaching to children and youths as they are more likely to absorb and retain the internal structures needed to bring about Peace to future generations. These methods of teaching have already been laid down by the Global Community during the 1990s. We are showing some of the papers with their links just below here. They were copied in an article for fast reading. In fact, these methods include the basics of what it means to be "a Global Community", and also include the original definition of the Global Community. This was at a time when no one was even thinking about these new concepts but today they are widespread all over the world. During the period from 1985 to 1995, except for our work Virgine and I, there was nothing over the internet promoting these new concepts. It took another five years before they became widely used. These methods of teaching will be further accentuated by newly researched and developed animations which are to show how children and youths can be taught to develop those internal structures so needed to bring about the event of Peace to future generations. Global Dialogue 2013 will thus be mainly concerned with the further teaching of these global concepts brought forward in the 1990s and in particular on the formation of a Ministry of Global Peace in the govenment of each nation of the world. 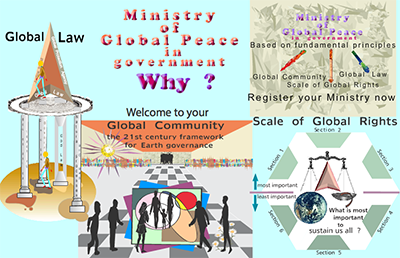 Global Community will make an extensive and continuous request to the government of each nation of the world to participate in the Dialogue and, hopefully, for each nation government to form a Ministry of Global Peace. In every era of history, we always had a group of countries which were drawn together by mutual common interests and benefits. Peace will be with everyone when everyone knows how we can sustain us all. We need the Sustainable Development Global Information Society to conduct research, educate and inform everyone. Vaincre la pauvreté est l'une des contributions d'humanité susceptible de favoriser la paix et l'harmonie. We must first look at relationships of cooperation and conflict. Our current focus is the campaign for a cabinet-level U.S. Department of Peace. We want a Department of Peace at the White House. The aim is the creation of a planetary ‘peace culture’. Honorer les Hommes et Femmes de tous pays, de toutes nationalités, de toutes origines, de toutes familles religieuses, spirituelles associatives, qui oeuvrent pour la Paix, sur le plan mondial, national, individuel. A new culture of peace, preventing wars, terrorism and poverty, is generated when a natural order of social harmony gives priority to the well-being of children, parents, and caregivers, who make up 50 to 80% of the population in any given country.These groups are basically peace-loving, and provide the social foundation for a harmonious, new culture of peace. Global Peace will be with all nations when all nations beging to connect with one another, the Earth and the Soul of Humanity.The large gap between rich and poor is connected to ownership and control of the planet's land and of all other Earth natural resources. We, the Global Community, must now direct the wealth of the world towards the building of local-to-global economic democracies in order to meet the needs for food, shelter, universal healthcare, education, and employment for all. Allison, Dana, Farida, Gael, Jodie, Katie, Medea, Nancy, Rae,Tiffany, Samantha, Susan Sarandon, Danny Glover, Willie Nelson & many more.. Throughout history, fasts have been used to end wars, gain the right to vote, free political prisoners, improve conditions for workers. Our goal is to bring the troops home. The Soul of Humanity is helping to bring about the event of Peace in the world. Knowing that Earth is a spiritual entity as well as a physical entity in space and time in the universe we begin to have a better relationship with Earth and with all its living inhabitants. This way Earth management will become a spiritual and a natural process whereby each person is responsible and accountable for its management the best they can. Peace in the world and Earth management have for far too long been in the hands of and affected by government and business leaders, in the hands of a few people on the planet, as opposed to being in the hands of all of us working together to keep our planet healthy. We are the keepers of the Earth. If humanity is not to become extinct then it is about time we reverted to exciting inquiry into collective intelligence and the power of connection.